We will be on the air today with our host Annie Rivera from "Annie Talks". The topic will be Annie Talks with JaMarr Brown | Author of Selling in Color | Keynote Speaker | Entrepreneur. 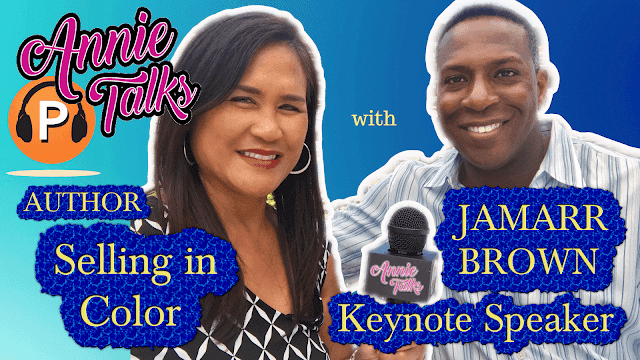 JAMARR BROWN is an author, keynote speaker, and founder of the "SELLING IN COLOR SALES SYSTEM." He is also the host of the "BREAK IT DOWN BROWN" Internet radio and online television program. He has an award-winning track record in Corporate America achieving such honorable awards as Sales Person of the Year, Sales Manager of the Year, and being a Vice President of Sales for a billion-dollar medical device company by the age of 30. He also successfully led the marketing efforts for a 200 million-dollar Pharmaceutical Brand. JaMarr is the author of 3 highly acclaimed books and several audio programs including his latest release title, "How to deal with post-traumatic sales syndrome."